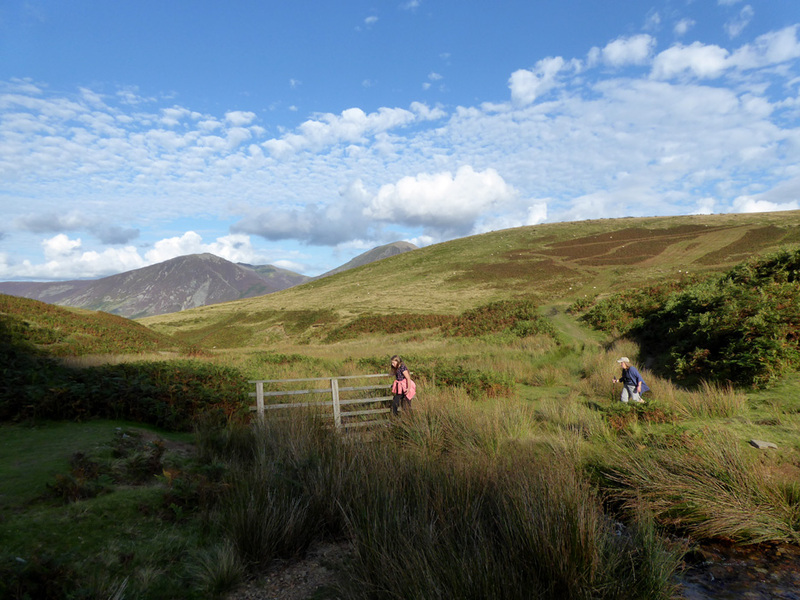 " Two local walks with Family and Friends "
Date & start time: Friday 7th August 2017, 4.15 pm. Places visited : High Nook Farm, High Nook Tarn, Watergate and back. 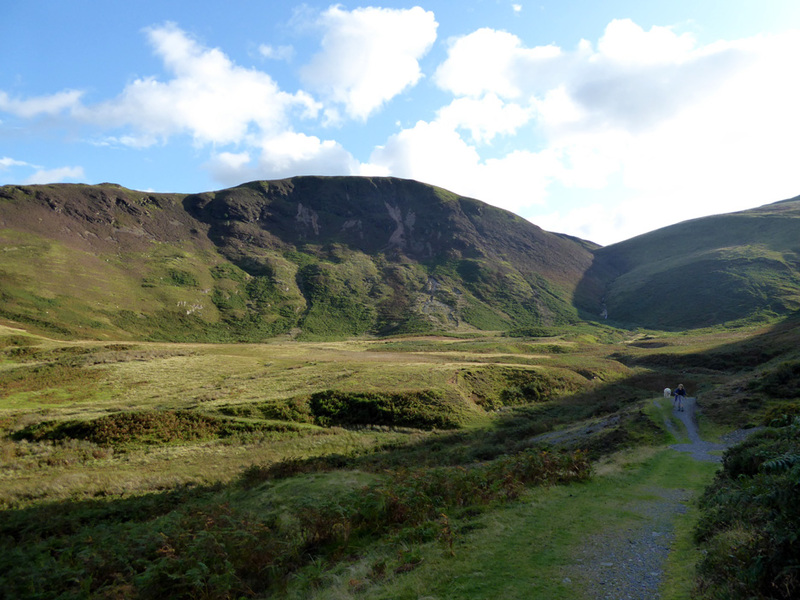 Walk details : 2.5 miles, 500 feet of ascent, 1 hours 25 mins. Highest point : High Nook Tarn, 725 ft - 223 m.
Walked with : Abi, Ann and our dogs, Harry and Dylan. Weather : Sunshine and summer skies. A change of family as Catherine leaves and Paula and her son Tom come to stay and join daughter Abi. 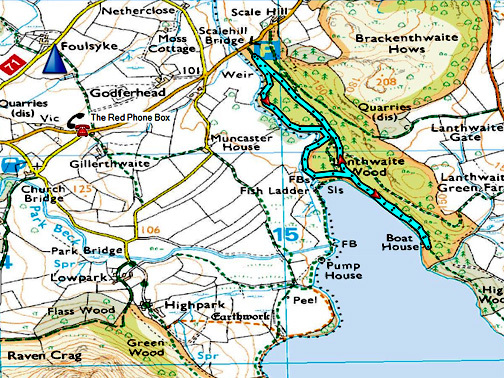 Tom is on a four day D.of.E Gold expedition, walking from Windermere to Keswick via Pooley Bridge. 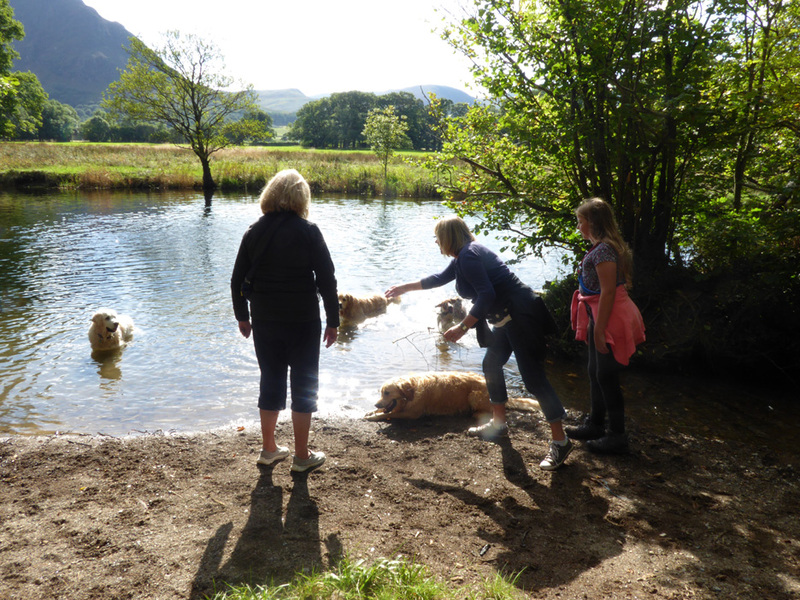 Paula is helping supervise the event so for the first two days days it is just Abi who stays with us here in Loweswater. Today's walk starts at Maggie's Bridge car park. 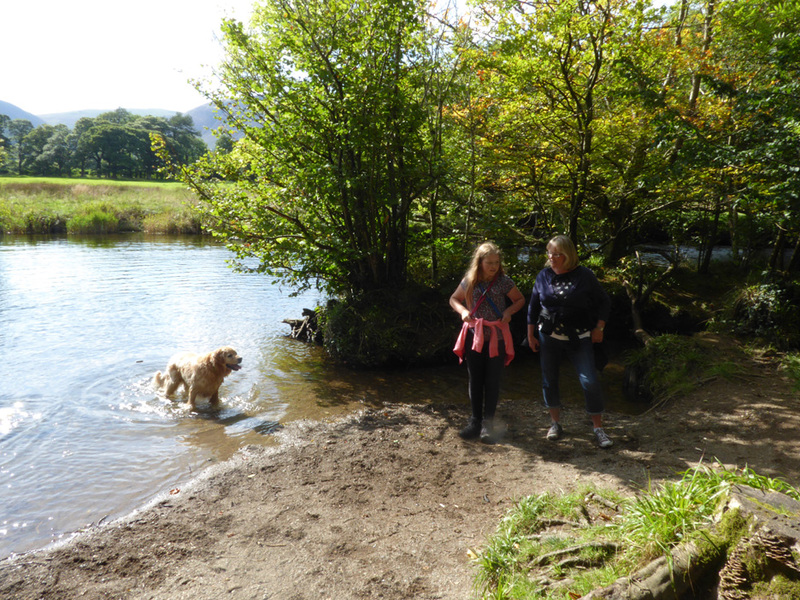 The sunny weather continues and as Abi has never been up to the lake, we decided to walk to High Nook Tarn. Harry's fitness seems to have improved and so this walk should be within his capability. 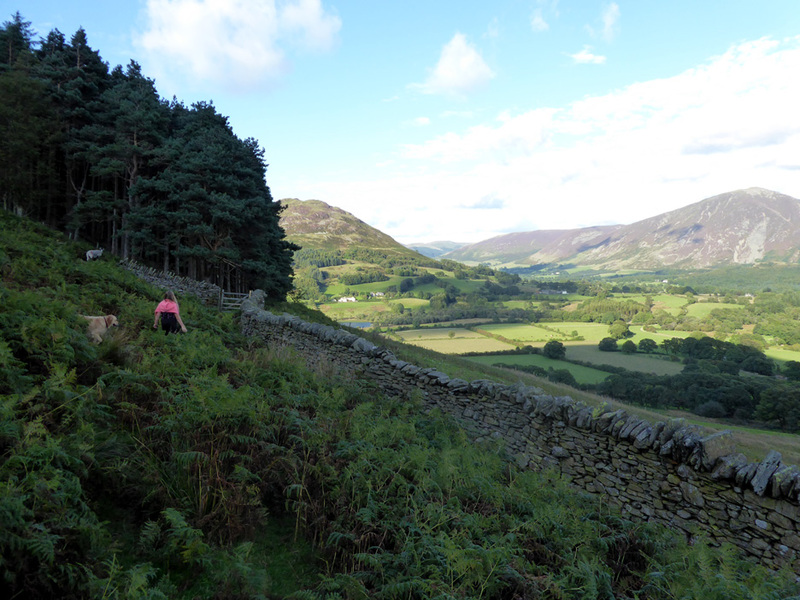 In this first photo we've already climbed up past High Nook Farm and are looking back down at the Lorton Valley. We leave the track and strike up towards the base of Black Crag . . . and all of a sudden the hidden tarn appears. 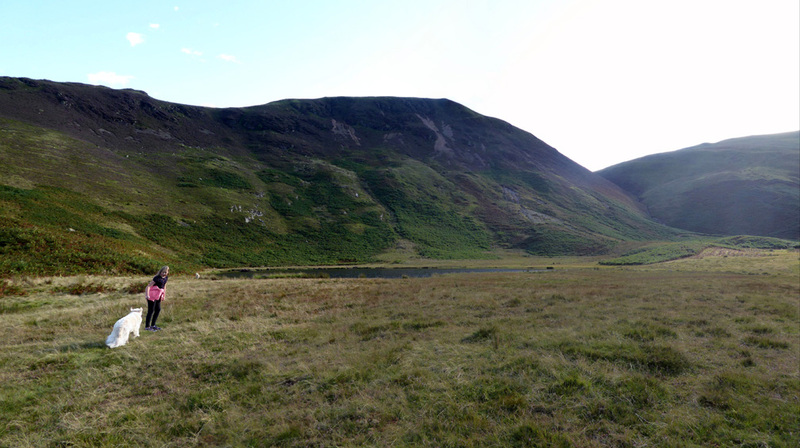 so the tarn is only topped up from the run-off water from the slopes of the crag behind. 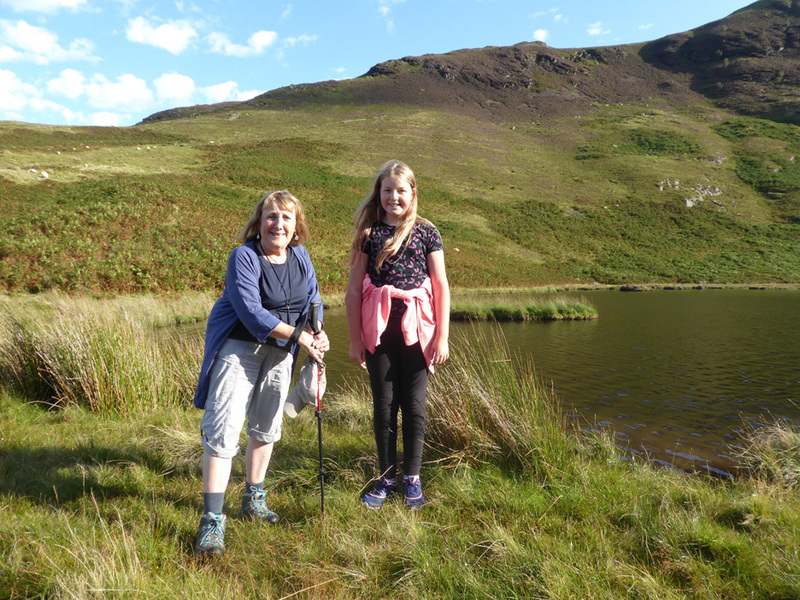 Ann and Abi alongside the shallow tarn. 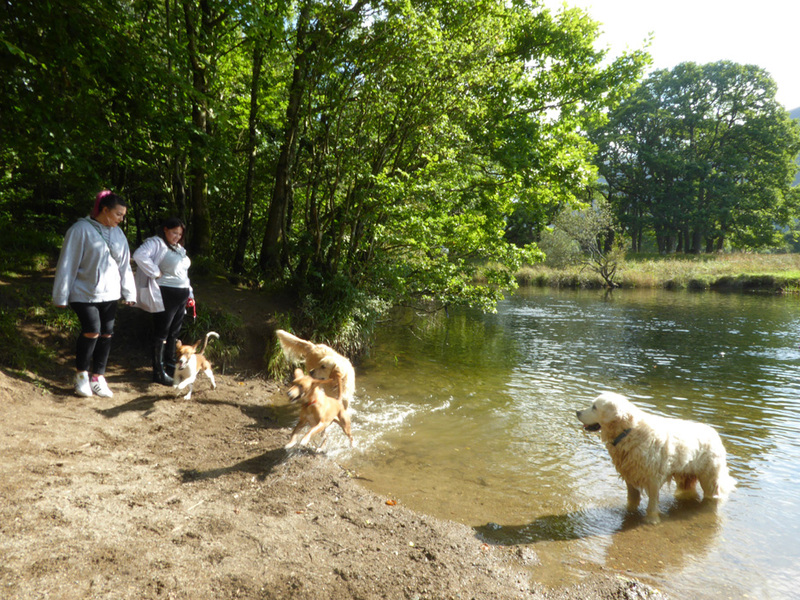 The brown nature of the water just at the edge is due to the dogs having swam past and disturbed the mud ! crossing both combined streams at the High Nook Beck foot bridge. The secretive nature of the tarn is revealed here as it can't easily be seen when walking the Coffin Road. and follow a track alongside the wall towards a gate entering Holme Wood. Fortunately the bracken is starting to die back and so this path is open once more. 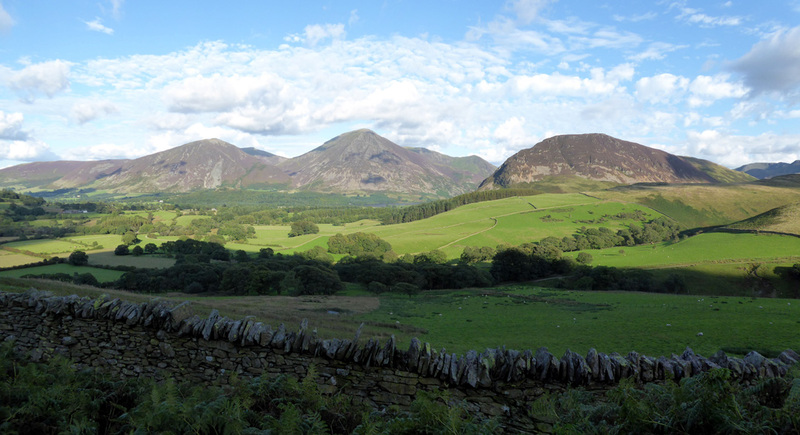 It gives a nice view across the valley to Whiteside, Grasmoor and closer at hand, Mellbreak. 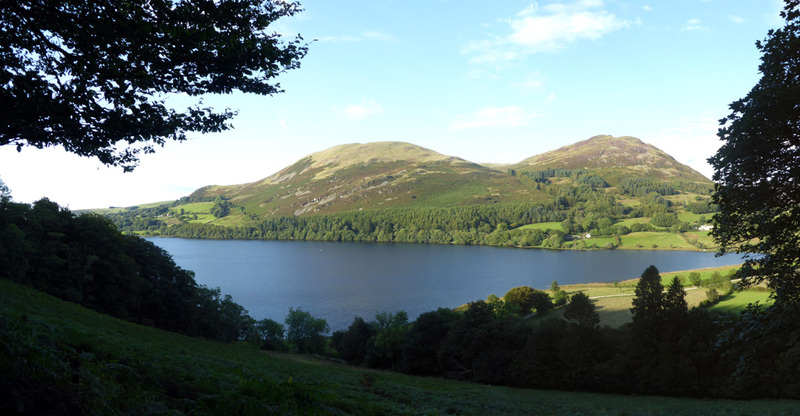 Ahead is Loweswater itself . . . the blue waters reflecting the lovely colour of the sky today. 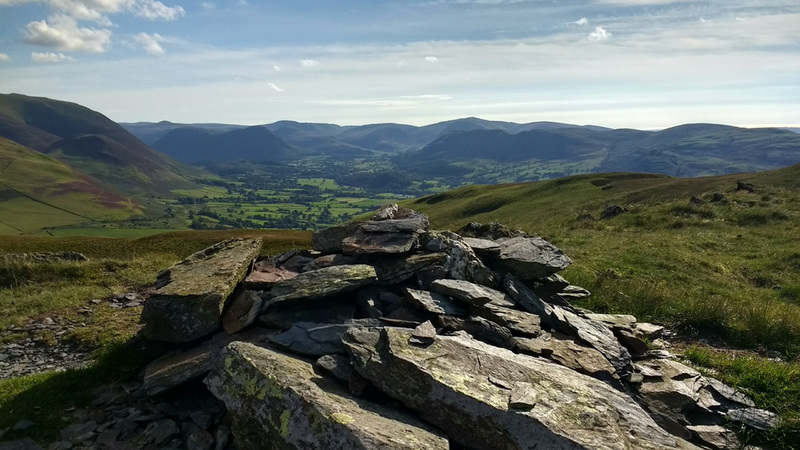 On the far side are Darling Fell and Low Fell's southern top. The path drops down to Watergate Farm and back across the meadows . . . offering us this view of Mellbreak once more. From here it is a short walk across the three fields to Maggie's Bridge car park and then a short drive home. of Oak Cottage nestling under the slopes of Mellbreak. 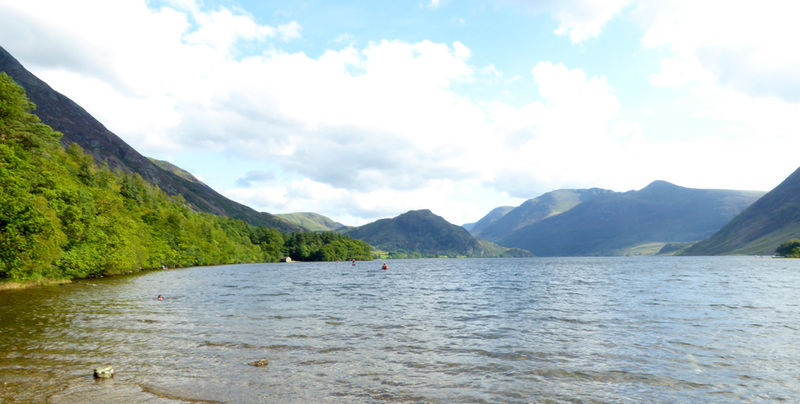 We met briefly in March this year while I was doing a circuit of Crummock and I do enjoy your website. 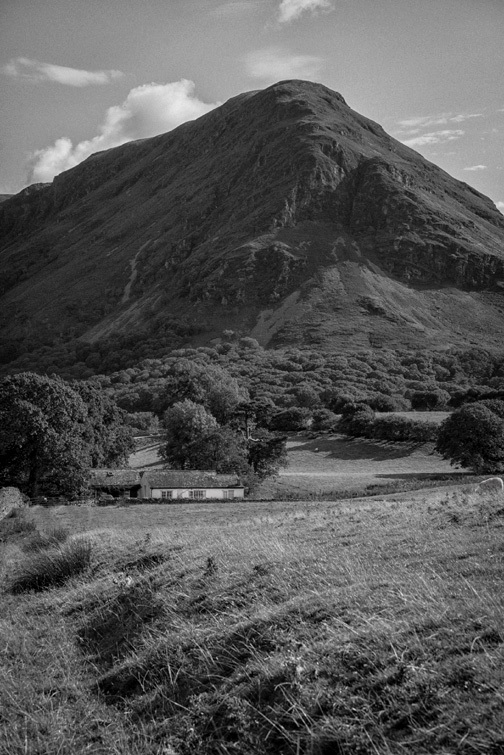 I was snapping in Loweswater earlier this week and took this one of (I think) your cottage – it seemed to suit the grainy mono treatment.
" 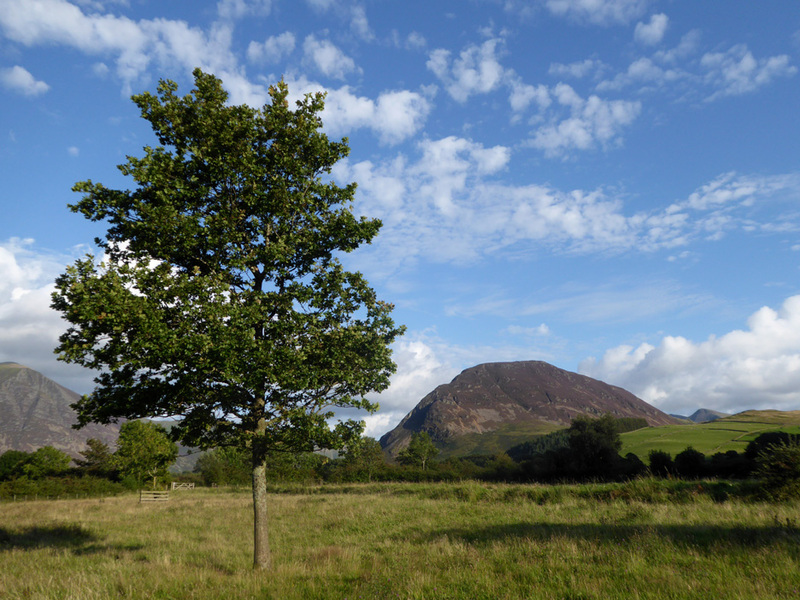 The second walks was with Paula to Crummock "
Date & start time: Friday 7th August 2017, 3.15 pm. Places visited : River Cocker, the fish ladder, boat house and back. 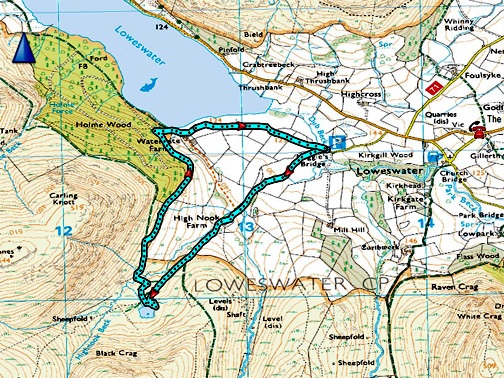 Walk details : 1.5 miles, negligible feet of ascent, approximately an hour. Highest point : Meeting and making friends. 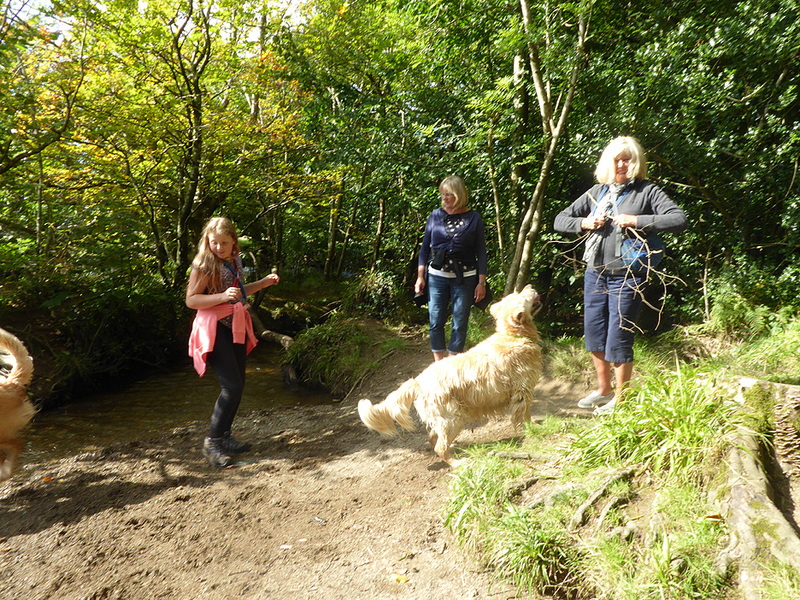 Walked with : Paula, Abi, Sophie, myself (Ann) and dogs Harvey, Harry and Dylan. Weather : Sunshine and summer skies again. 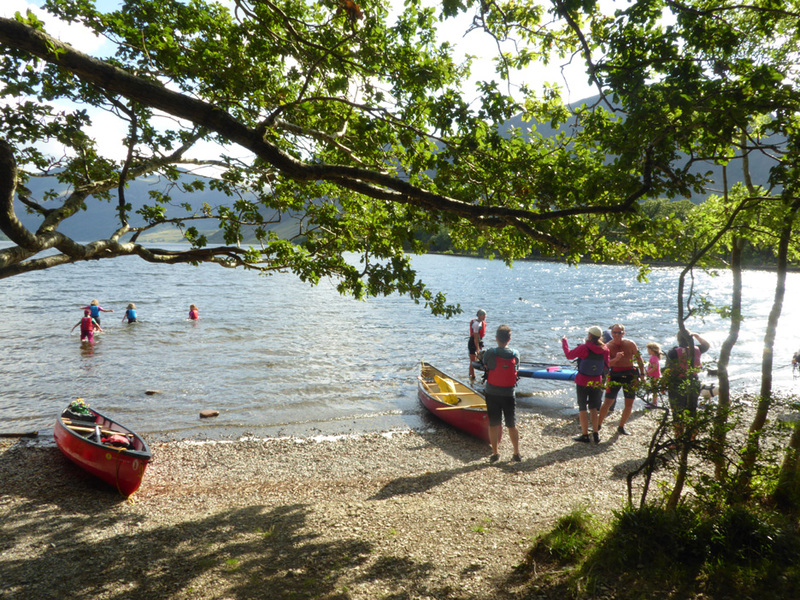 The second of the walks, again a popular local one, was to the boathouse on Crummock. Paula was with us now that Tom had successfully completed his expedition. so when Sophie called round the rest of us combined forces for a walk to the beach. 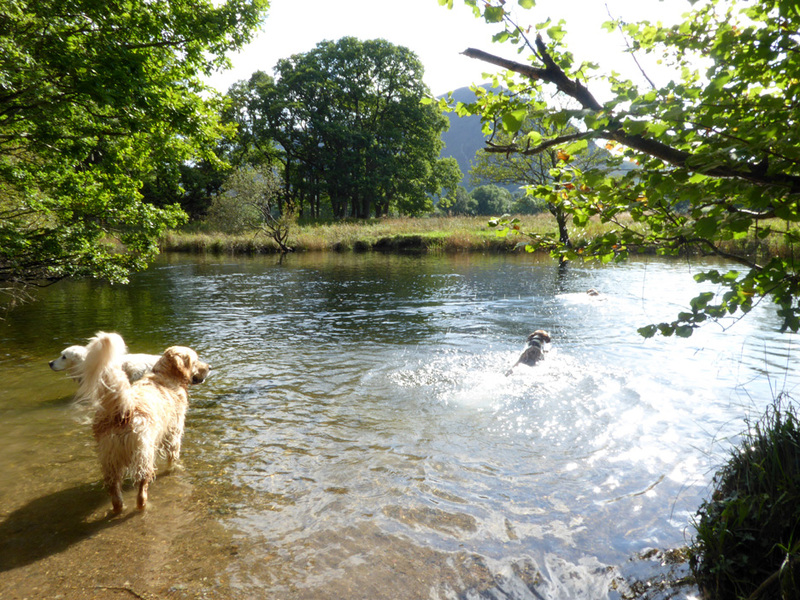 There are several nice pools on the river as we walk upstream towards the lake. 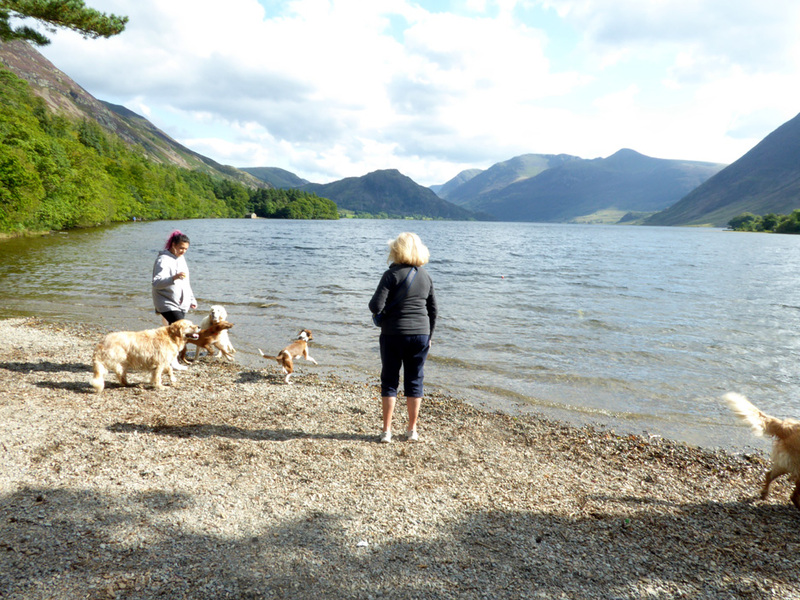 Chance to meet up with other visitors and other visiting dogs. Sophie breaks a stick in order to throw it for the dogs. Watch out Abi . . . wet dog passing ! I'll fetch it . 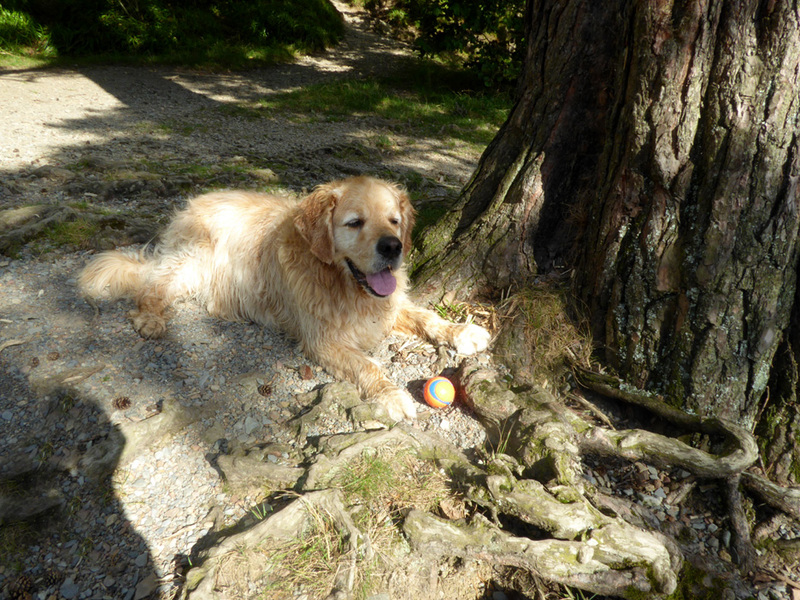 . .
A short time later and we had reached the beach by the pine tree. The dogs never stop playing. Harvey like Harry, represents the older contingent who are allowed a little rest once in a while. He'll guard his tennis ball ready for the next kind person who will throw it into the lake for him . . . just give him a minute. Looking up the lake to Rannerdale Knotts and the High Stile Ridge. Intrepid travellers from eastern lands. They stop for their older paddlers to take a break . . . and the youngsters to play in the water. 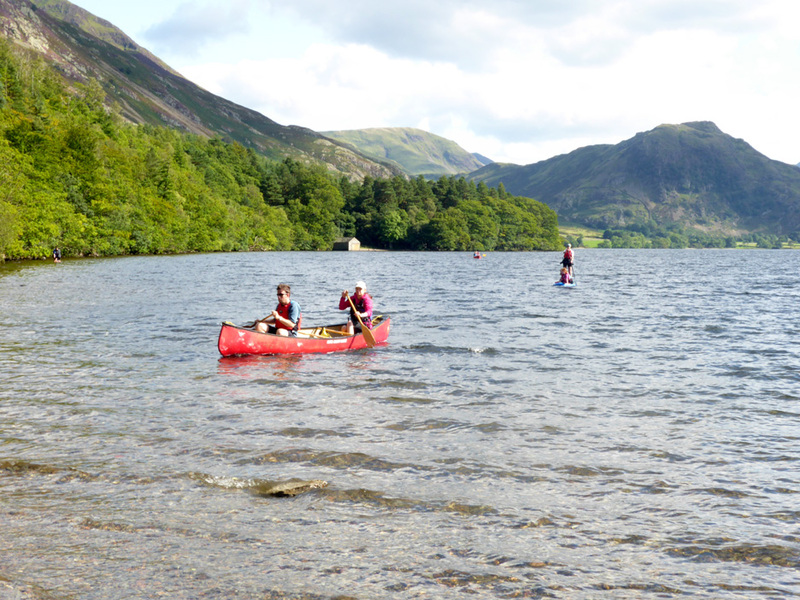 and were paddling back up the lake. Time to be heading back to make sure Roger hasn't eaten all the cake ! 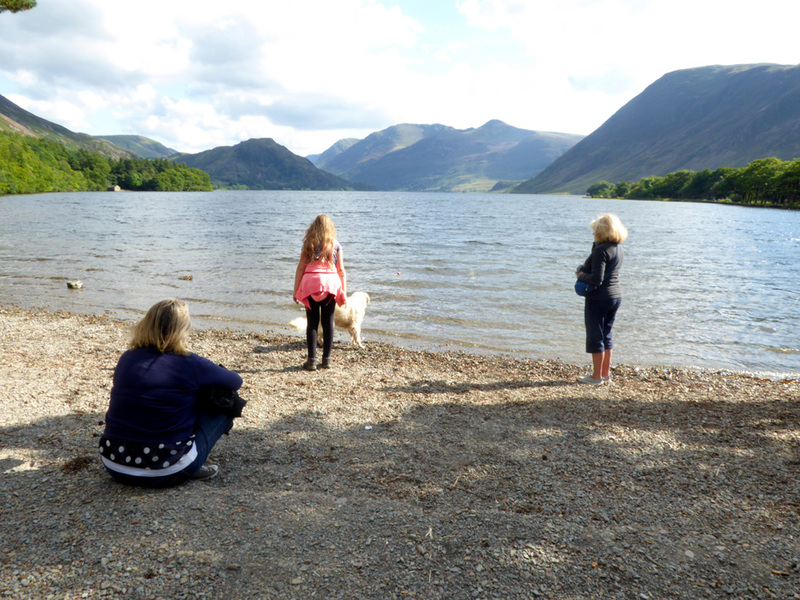 The day before the Loweswater Show . . . from Graystones. Thought I would send this for you to expand for view of the tents. What cracking views from here this afternoon; when we should have been painting the shed .... ah well. We'll look out for you tomorrow. Good luck with your entries. Hold your cursor over the picture to see the tents in closer detail . . . they are just above the top stone of the cairn. Thanks for sending the photo Christine . . . see you tomorrow, hope the weather holds . . . RmH. Technical note: Pictures taken with either Ann's Panasonic Lumix TZ60, or my Panasonic Lumix Gx8 Camera. This site best viewed with . . . a full cake tin ready for visitors.